Oh. Em. Gee. I recently tried the new-ish Walmart Grocery Online Order & Pickup Service and it’s a grocery shopping game changer, y’all. Especially if you have little kids, or are pressed for time. I love it. I almost gave the Walmart lady a hug while she was loading groceries into my car. Too far? 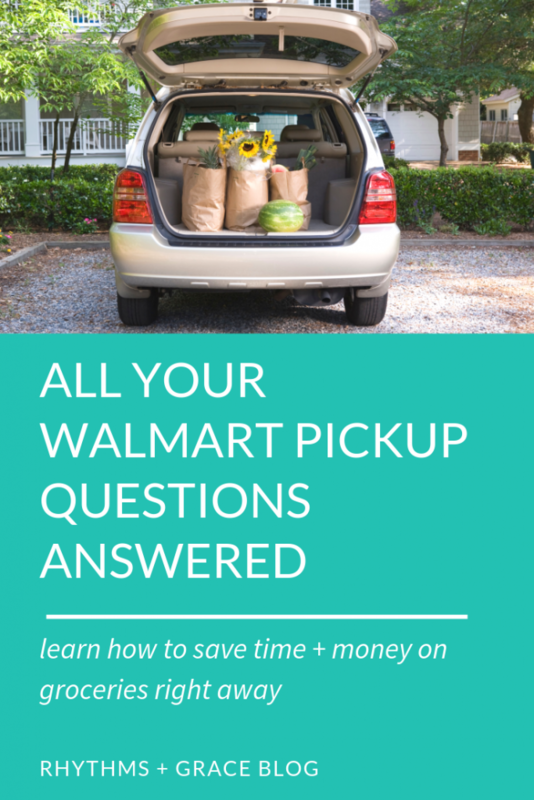 Update 2019: I’ve been using Walmart Grocery Pickup almost exclusively since it came out. 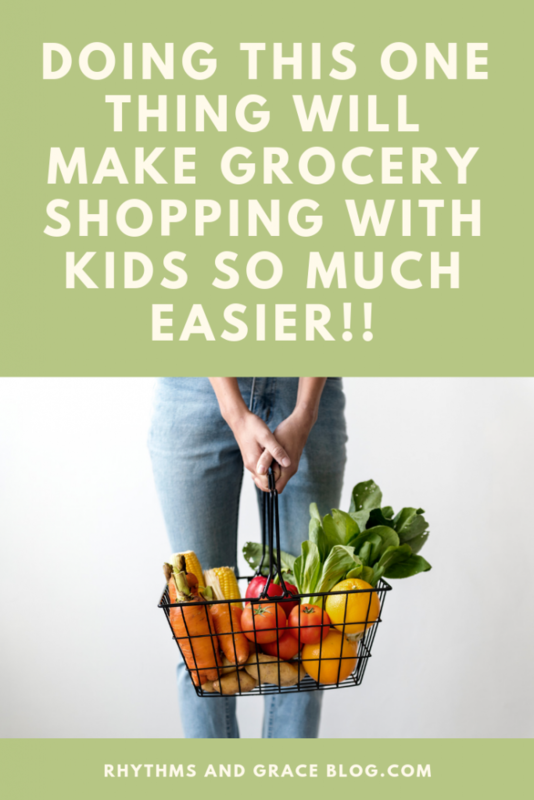 It’s a game changer, especially if you have kids!! I highly recommend Walmart Pickup to anyone who wants to find more time in their life. (Which is everyone, right!?) Here’s a $10 off coupon to try it. If you use it, we both get $10 off. Win win!! I’ve purchased things on walmart.com in the past (photo gifts, tires, etc…), and honestly, it’s one of the worst online store platforms out there. Haha. BUT, the Walmart Grocery platform is awesome! (Go HERE to start ordering!) I still made my menu plan and list like I usually do. Here is my awesome monthly meal planning calendar FREEBIE! I just searched each item and options came up based on popularity. They also use an algorithm to track what you buy and then save your most frequent purchases to make future ordering even easier. The search results are really good. 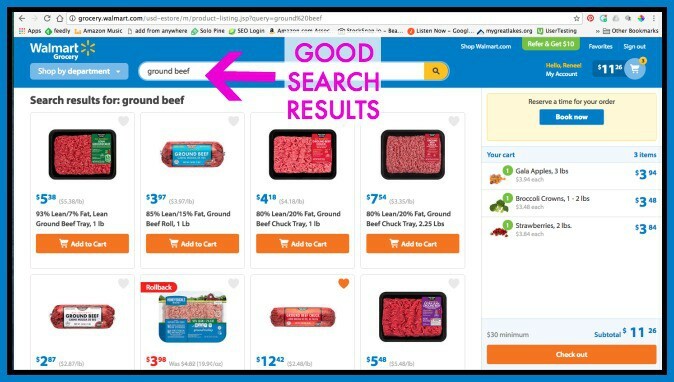 Everything is clearly marked, and if you’re used to shopping at your local Walmart anyway, it’ll be even easier to identify what you want because the items look the same online as in the store. Also, the unit prices are clearly displayed for everything. It’s actually easier to price compare online than in the store. In fact, my new life goal is to never enter Walmart again. The first time I did a Walmart Grocery order, I placed it Thursday to pick up on Saturday, not knowing you don’t need to do it that far in advance. On Friday, I thought of 9 things I forgot! At the bottom of the confirmation email, they’ll tell you the deadline for editing your order, usually midnight or 1:00 am the day you’re going to pickup. I mark everything that is a weekly “regular” item for us (milk, eggs, bread, produce favorites, etc.) with the favorite heart and shop from there first. Talk about FAST and EASY! You don’t get charged until pickup, and you get whatever the lowest prices are at the time of pickup! For example, if you order Thursday and gala apples are $2.50/lb but then when you pickup Saturday, there’s a special of $1.50/ lb, you get the lower price. BUT, if you order Thursday when they’re on sale for $1.50 and the price goes back up Saturday, you still get the lower price of $1.50. 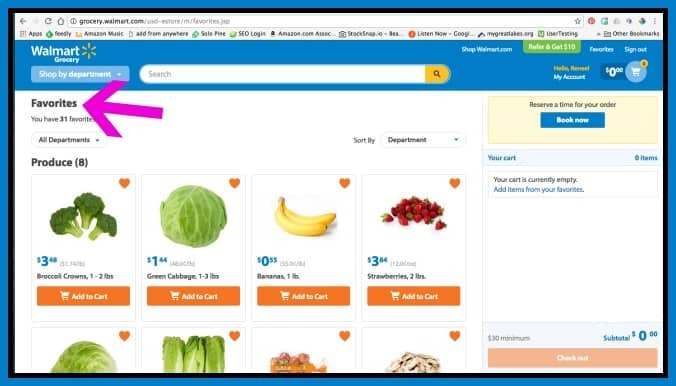 These pictures show you how to use Savings Catcher with the Walmart Online Grocery Service, but it’s pretty intuitive. 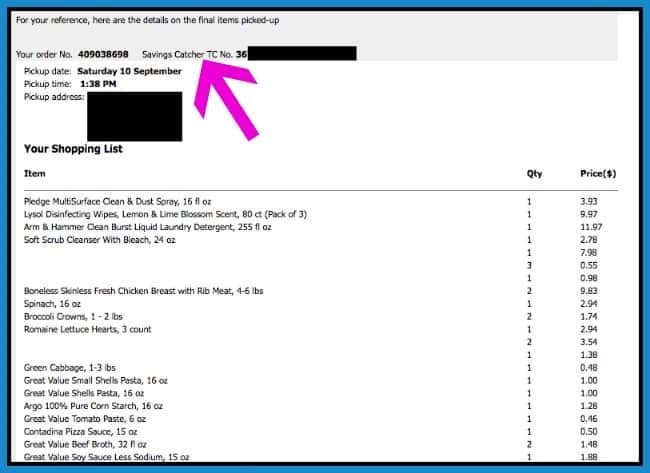 #3 – Click the blue button that says “Type receipt info” (you’ll need the Savings Catcher TC Number from the receipt they emailed you after you picked up your groceries). 4. If they don’t have it, you win! If they don’t have what you ordered, they try to find something better. They’ll often sub a bigger quantity and/or a name brand. You pay the cheaper price though. So if you order a $1.48 -18 oz jar of jelly, and they don’t have it, they’ll give you the 32 ounce size for $1.48. And you can always just say, “Nah” if you don’t want the substitution. You can actually say no to any of the items. Once I ordered chicken from Walmart Pickup, forgetting I already had a bunch. So when I got there, I just told them I didn’t need it, and they cancel that item for you. You use the app to “check in” when you’re on your way to pick up your groceries. If you miss your time slot, no big deal. Just go when you can! They’re usually really understanding about this at my Walmart. You pull up to a clearly marked parking spot on the side or back of the building and nice, and the GPS-connected app notifies them you have arrived. At our Walmart, the employees are usually organized, quick, nice to my kids, and very cheerful. Mind blown. This was a surprise benefit for me! I did not at all expect this to be a big money saver. In fact, I assumed that by shopping at Walmart instead of Aldi, we’d be spending more money, and we decided the convenience was worth the slightly higher grocery budget. No Impulse Buys. Duh! I would think this could end up being a major money-loss for Walmart… big box stores count on impulse buys to jack up profit. Ordering groceries online, you don’t stroll every aisle remembering that oh yeah you did mean to put 5 packs of Oreos on your list and by the way, you do need that new hoodie and a cute coffee mug. No accidental extras that are on sale. I’m sure this never happens to you, but I will see something like balsamic vinegar on a great sale, and grab one or two even though it’s not on my list. I’ll think, “Way to go, Renee! That’s a great deal, it won’t go bad, and we’ll definitely use this!” Only to find when I get home that I did that 2 weeks ago and 2 weeks before that, and the reason balsamic vinegar isn’t on my list is because I already have 5 bottles that I bought at a great sale price. The sneaky once-in-a-life-time-it’s-on-sale phenomenon does not happen if you order groceries from your computer in the kitchen. You just open your cabinet, see that you do, in fact, have a year’s supply of balsamic vinegar, and do not add that product to your digital cart. Sale lovers’ problems solved. You can order anything except clothes from the grocery service… and have it brought to your car. 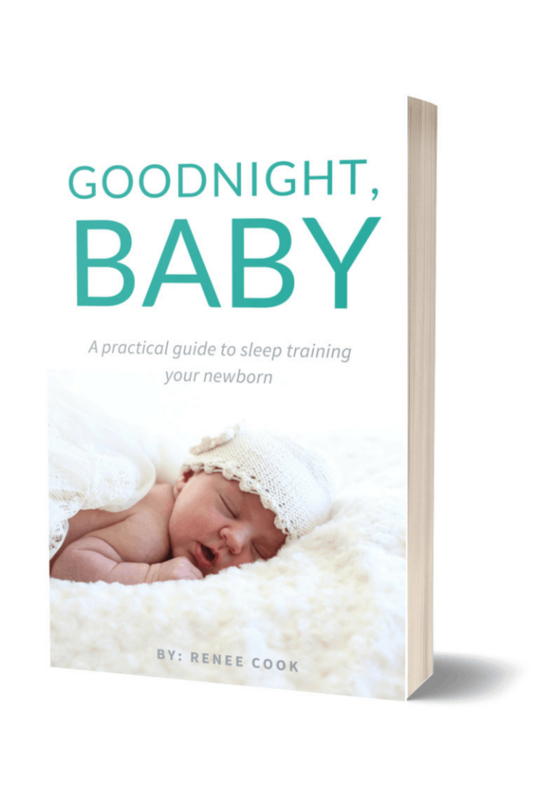 I repeat: WHY IS EVERYONE ON THE PLANET NOT USING THIS!? Diapers, casserole dishes, ibuprofen, hair clips, clorox wipes, cleaning spray, bleach, brooms, lawn bags, furnace filters. Everything that your Walmart sells as long as your minimum totals $30. Except clothes. I’ve price compared a handful of household staples between Walmart Grocery and Amazon (we have Amazon Prime), and Walmart won on almost all of them. I used to primarily get groceries at Aldi and make a once-a-month Walmart trip to get random household and baby stuff. Now, I just order everything we might possibly need every 7-10 days and go pick it up in one trip. And I don’t have to get the kids out of the car. As you can imagine, the whole process is a HUGE time, energy, and sanity saver. Reserving a whole morning outing for the grocery store. Shopping various sales and coupons and trying to figure out where stuff is cheapest. Mentally adding up groceries while I shop. Busting out my phone calculator to quickly calculate the unit price of toilet paper. “Mom I have to go potty right now,” when we’ve been in line for 10 minutes and it’s almost our turn. GINORMOUS carts and packing snacks and losing lists and going over budget. It’s so easy. And convenient. And efficient. And it saves money. I am clearly biased and absolutely not giving an “objective” review, but I cannot think of 1 reason not to do this. Unless they don’t have it in your area yet, in which case you should just go to your regular old grocery store and wallow that Walmart Grocery Pickup is not available. Or if you love grocery shopping. Which used to be me. 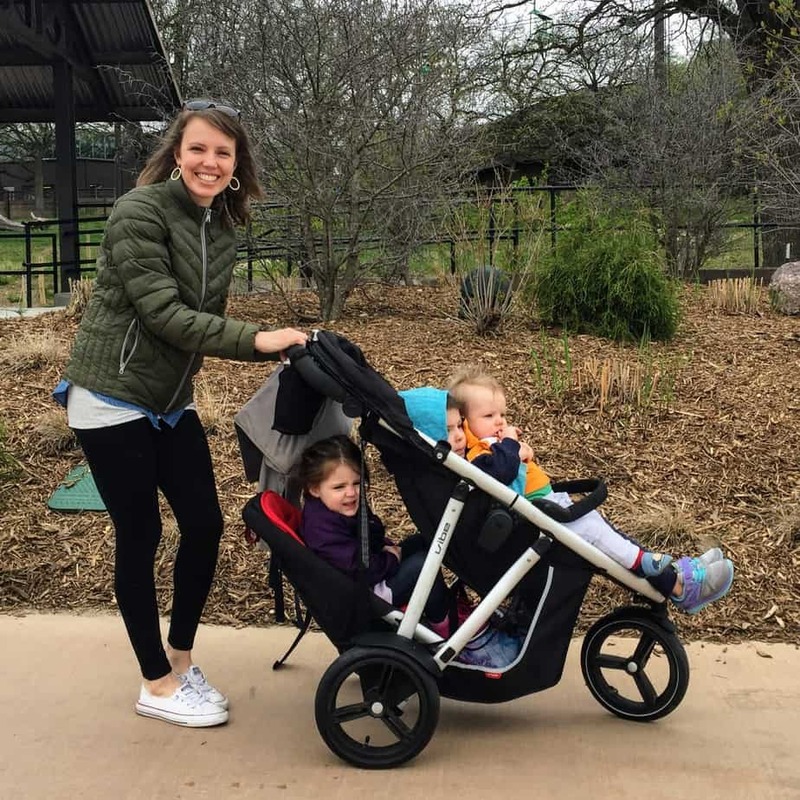 Before I had 4 kids under 6.
what about our beloved Aldi!? If you’ve read this blog for a while, you know I’ve loved Aldi for a long time now, and still do. In fact, I feel a bit like I’m cheating on good old Aldi, and will probably still go there occasionally for certain food items that they practically give away for free. It’s my long-time favorite grocery store for a lot of reasons (which I wrote about here). 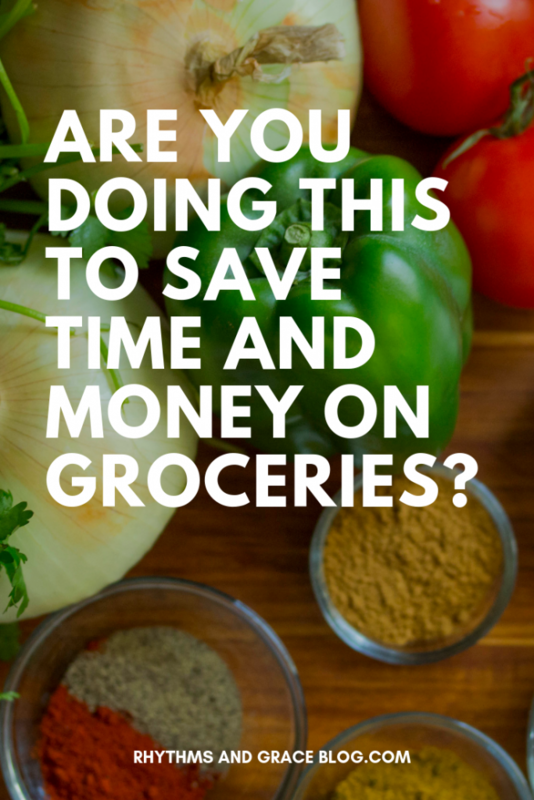 Have you tried Walmart’s online grocery thing? Do you like or dislike it? Are you going to try it!? I was literally planning to try this out tomorrow and just happened to see your review tonight! My Wal Mart just started this last week. Now I am even more excited to try it out.!! !